When it comes to organising baby items and toys, I like to use boxes. I have a house full of boxes. My husband dreads going to places like Ikea as he knows we will come back with storage! Before Amelia was born I wanted to find a box that I could use to store the items I would need to use for changing her nappy. I came across a set in Ikea called Lattsam basket set. 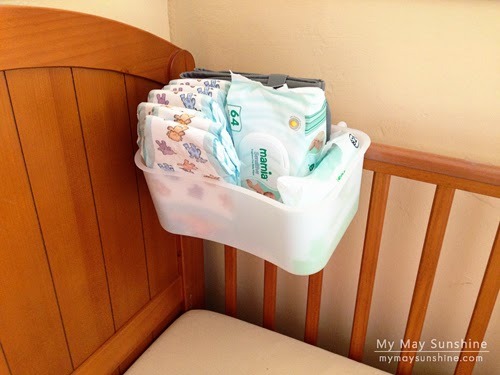 The set contains a large bin with lid, medium bin and a small bin and the large and medium have removable clips as they are designed to fit on a changing table. I used the large bin as a rubbish bin in the car and used the small one in the bathroom. The medium bin is what I decided to use for this project. 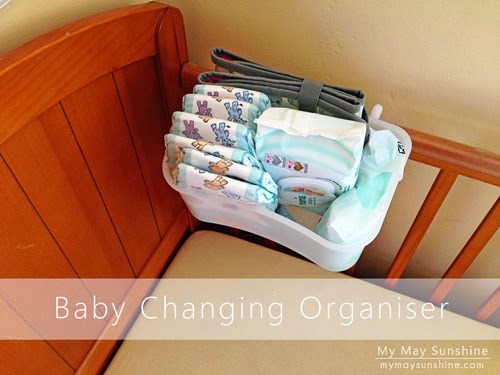 I kept the clips on the bin and put the things in the bin, like the nappies, wipes, mat etc, that I would need to use most often. 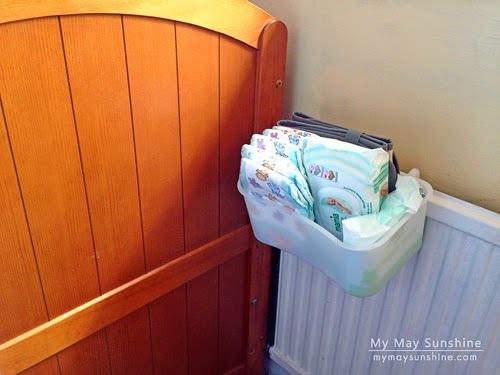 When Amelia was in our room in her moses basket and then in her cot, I put the bin on the rail on the side of the cot. When Amelia moved in to her sister’s room, I put the bin on the top of the radiator. I didn’t keep it in the cot as she moves a lot more now and obviously the radiator isn’t on at the moment as it’s summer but it’s only on low when it is so I am not worried about it. Normally the bin stays upstairs as I have a bigger box downstairs, but it could easily be moved around the house. It’s so handy instead of looking for everything separately and so easy to refill. Small organising projects might not seem like much but can be really helpful when you are in a hurry. I love it when I find something that makes life a little bit easier! Linked up to: A Bowlful of Lemons.